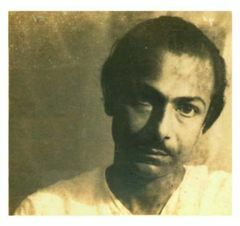 Salil Chowdhury (1923-1995) was a famous Bengali composer and poet. He was born on November 19, 1923 and died on September 5, 1995, just before his 72nd birthday. One of India's original musical talents, he was widely recognised and acknowledged in the Bombay film industry as one of the prodigious talents on the lines of Naushad, Shankar-Jaikishen, etc. He was also an accomplished composer, and was proficient in several musical instruments, including the flute, the piano, and the esraj. Regarded as one in the league of intellectuals having born in the state of West Bengal, he was also widely acclaimed and admired for his inspirational and original poetry. He was fondly and reverently called Salilda in Bollywood. There are two distinct phases in Salil's life. The first phase, very much non-professional in intent and appearance, started in the pre-independence era of the 1940s and went on till mid '50s. This was followed by the second phase which was more professional in its content. During the first phase he was a brilliant lyricist,songwriter,poet and a playwright. He was much more mature composer than anything else in the second phase. The composer in Salil reached the greatest heights in his second phase which basically started when he arrived in Bombay to compose music for the film 'Do Bigha Zameen'. This was the Hindi version of the successful Bengali Film 'Rikshawalla'. He himself wrote the story of 'Rikshawaala' and composed its music as well. Since Do Bigha Zameen, he has composed for over 75 Hindi films, around 26 Malayalam films, and several Bengali, Tamil, Telugu, Kannada, Gujarati, and Assamese films. To the music connoisseurs, he was better known as the non-conformist music composer whose unceasing search for perfection towered above everything else in his life. Salil's music was a unique blending of the Eastern and the Western music traditions. He had once said: 'I want to create a style which shall transcend borders - a genre which is emphatic and polished, but never predictable'. He dabbled in a lot of things and it was his ambition to achieve greatness in everything he did. But at times, his confusion was fairly evident - 'I do not know what to opt for: poetry, story writing, orchestration or composing for films. I just try to be creative with what fits the moment and my temperament' he once told a journalist. Salil's love for Western classical music started when he was a young boy growing up in an Assam tea garden where his father worked as a doctor. His father inherited a large number of western classical records and a gramophone from a departing Irish doctor. While Salil listened to Mozart, Beethoven, Tchaikovsky, Chopin, etc. everyday, his daily life was surrounded by the sound of the forest, chirping of the birds, sound of the flute and the local folk-music. This left a lasting impression in young Salil. He became an excellent self-taught flute player and his favourite composer was Mozart. His compositions often used folk melodies or melodies based on Indian classical ragas but the orchestration was very much western in its construction. He developed a unique style which was immediately identifiable. Salil Chowdhary's first Hindi score was 'Aa Ri Aa Nindiya' from Do Bigha Zameen (1953).This was a very difficult number. There was no breathing space between the lines. Salilda recorded two versions of the song, one with no orchestra. He wanted to create the feeling of solitude as Meena Kumari sat singing all by herself. In the year 1958 film Madumati was released and its compositions were beautiful reflecting Salil's talent and Lata's sweet voice . One of the compositions is 'Aaja Re Pardesi' .This song won Lataji her first Filmfare award. The then great singers like Kishore Kumar , Mukesh , Lata Mangeshkar lent their voice to Salil Choudhary's compositions creating history making melodies. Lata Mangeshkar remembers that once when Bimal Roy persuaded Salil da to sing a complex Bengali song. Salil Chowdhary obliged and was alarmed to find that young Lata had fainted. She confesses, 'While listening to the song, I was overcome. I couldn't control myself'.